...Starting a widows support group in Stratford, Ontario, Canada. First meeting in 2 weeks....dinner and a speaker. No idea how many will attend. Open to all widows--- Christian and non-Christian. Calling ourselves Stratford Lifeboat Widows Support Group. We swim through storming waters after we become widows, then reach for those already in the boat for support, encouragement and friendship. For those of us who believe in Jesus...He is the anchor in this journey. Asking for prayers... Thank you, and would appreciate any suggestions and ideas. 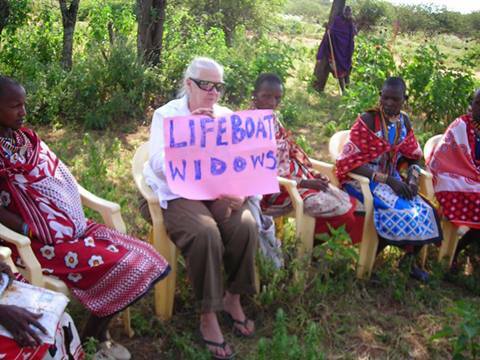 Blessings, Nellie M.
In the summer of 2011 I started one private widows group on Facebook and named it Lifeboat. I added just about every widow I knew, which might have been only 30 or 40 ladies. When it got up to over 100 members I started Lifeboat 2. Now, a few years later, each "boat" has more than doubled and I've added two more "boats!" But the best thing to see is when women create their own Lifeboat (or other named) widow groups. Like my friend and co-laborer in the Lord, Miriam Neff says, "No one understands a widow like another widow." Check out Miriam's website for the groups she has started in the Chicago area, and then Africa, and now into Europe! P.S. I'm delighted to tell you I'll have an update on the group in Ontario after Thanksgiving. I was so excited to hear what they're doing, and I know you will be too! AND I heard of another group in Kenya!